Stunning character semi detached house restored to an exceptionally high standard with original features and modern contemporary living. 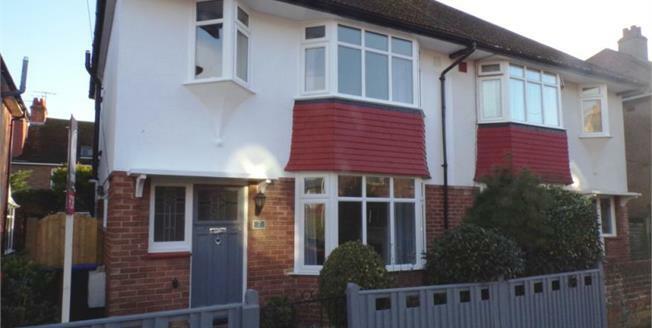 Situated in the popular Thomas A 'Becket catchment area with local shops, Tarring Village, mainline railway station, bus routes and park close by. The property is well situated to Worthing town centre with its comprehensive range of shops, restaurants, pubs, bars, cafes, cinemas, theatres, leisure facilities and of course Worthings' fine seafront and pier. This fantastic property comprises downstairs; entrance hall, lounge with bay window, open plan kitchen dining room with bi-folding doors to garden. This gives the property a lovely social space to entertain. Upstairs are two good double bedrooms and a single third. The luxury family bathroom has been modernised with bath and separate shower cubicle. This is an exceptional house and viewing early is highly recommended.